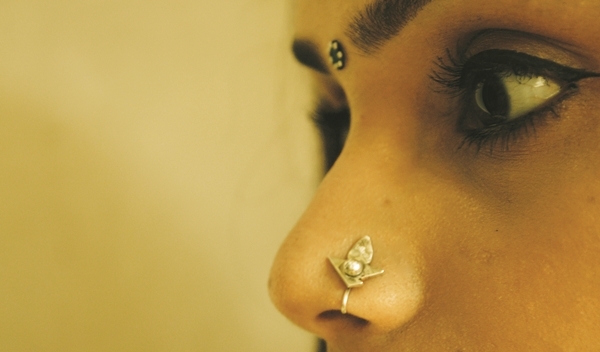 NGINEER-turned jewellery designer, Rohita Vee is still pleasantly surprised that her nose pins have got her this far. Inspired by the kolam and other culturally-significant geometric designs, the Chennai girl retails at two stores in the city and Bengaluru, besides her Facebook page, and hopes to have an e-commerce site up next year. a�?I began with costume jewellery, featuring fabric and beads, and after a short course at the London Jewellery School, was confident enough to work with copper, brass and silver,a��a�� she says. Roia, a combination of letters from her name, translates to a�?a dreama�� or a�?visiona�� in Persian. a�?Roia is all about wearable luxury,a�? adds Vee, 24, who is comfortable working with both fused glass and the Korean Keum-boo gilding technique. It has her adding gold accents to silver jewellery and, she hopes, will help her combine unexpected materials and colours. For now, she prefers metal sheets and tubes, wire, patinas, resin and fused glass, together with natural gemstones and semi precious pearls, turquoise, amethyst and jade. Pieces include earrings, necklaces and hand-cuffs, besides theA� nose pins. a�?My designs are contemporary with a hint of quirk. You will find modern geometric cuts with tribal detailing and pops of colour,a�? Vee explains, talking about her kolam-themed graduation collection in London. She is also willing to custom design, calling it an opportunity to think differently. For Timri in Bengaluru, she has designed nose pins, named Behiye (Turkish for beautiful), that draw inspiration from Ottoman architecture. She also recommends her textured and oxidised sterling silver earrings with freshwater pearls, from her second collection Spartan. At MaalGaadi, she has aA� Geotribe line, featuring hexagons with stamp texture. Plus she will be exploring the ear-jacket trend.Dreaming up designs in her brothera��s room, now converted into her workshop, she says her boho vibeA� journey has just begun.